Did you change your Smoke Detector batteries??? Welcome to the web site of Columbus Junction Fire and Rescue. This site is designed to allow you to learn about our department and its history. Our firefighters are some of the best in the state and are extremely proud of their fire department. With their pride, comes commitment; a commitment that has been forged by a belief in core values such as honor, dedication and integrity, providing exceptional service to the citizens of our community each time we respond to an emergency. 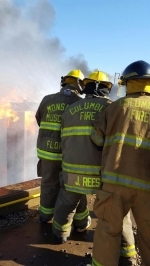 As the Fire Chief of the Columbus Junction Fire Department, I am proud to lead the highly trained and dedicated firefighters who freely volunteer their time and energy to protect life and property. Our department is committed to providing the residents of our district with quality fire, rescue, and emergency services in the most cost effective and efficient manner. This site has been viewed 15,534 times.